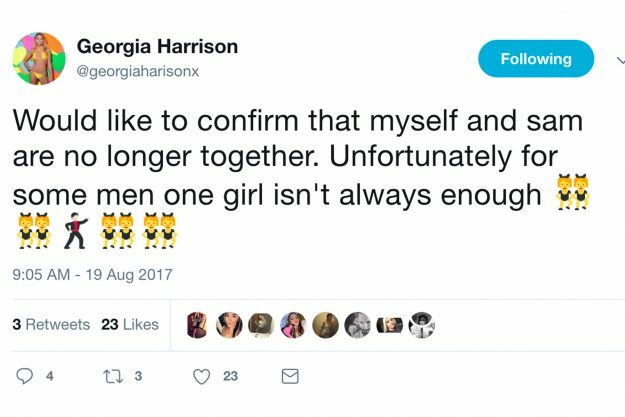 Love Island‘s Georgia Harrison has spoken out about her love life since splitting with Sam Gowland. Georgia confirmed the relationship with her Love Island partner was over when she took to Twitter to imply he had cheated on her. “Would like to confirm that myself and Sam are no longer together,” she told her 70.2k followers. The former TOWIE star was later pictured partying with DJ Roman Kemp, and now Georgia has revealed all about the rumoured romance. Speaking the Sun Online, Georgia revealed: “Obviously we did meet at V fest and I heard he was talking about me when I was on Love Island, we’re just literally friends, but I do think he’s really fit. However, the reality star was doubtful as to whether anything could blossom. She continued: “Whether or not he would want to pursue something with me, I don’t know – I doubt it! I would be very shocked if someone like him would want to go out with someone like me to be honest. “I get like this every time there’s a boy I like I just think he won’t like me. It’s really weird, I don’t put myself down but when it comes to men, as soon as I like someone I just feel like I’m not good enough to talk to them. “If I know a boy likes me I can keep him on his toes, but as soon as I start to like them I think, ‘Oh my god no, he’s not going to like me.’ It’s definitely something I need to work on. Georgia may have been a bit unlucky in love so far this year, but she still remains hopeful that her Mr. Right is out there. She said: “I think you have to try and be positive, I feel good things are coming. Love Island will return to ITV2 in 2018.